Jet Set Radio Future - Pioneer Project - Enjoying video games a little differently. It's hard to imagine gaming without Jet Set Radio Future. There's a lot of love for this quirky game online. As a game premise it seems outwardly bizarre, yet indescribably fun. The game's bravado and musical style are frequently lauded - but it could be a special game for other, braver reasons. Jet Set Radio Future was developed by Smilebit for the Xbox console back in 2002. The original game (known as Jet Grind Radio in the States) was one of the first in a wave of cell-shaded games, both titles were crafted with a special kind of panache and this suits the content matter perfectly. 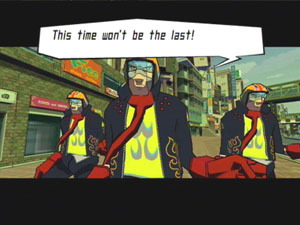 Jet Set Radio Future is tale of youth rebellion against the corporate oppression of Tokyo in 2024, told solely from the perspective of the street. Groups of skate gangs known as Rudies vie for supremacy over one another and the various authorities that attempt to crush them. 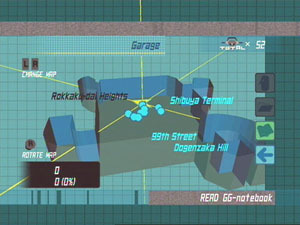 The original Jet Set Radio indicates that many of the original GG members have run away from home and into the arms of the streets of Tokyo. It’s safe to assume that most of the cast of characters are homeless,(1) and rather than being perpetually displaced by the prevailing chaos, they decide to take matters into their own hands and rise against it. The teenage skaters do so with paint alone, making every part of Tokyo indelibly theirs, from the underground sewer system to the glitz of the skyscraper district with no sense of reluctance or discrimination over the status of the area. And yet, given the political situation of this not-so-distant future, you can’t help but wonder if this skater gang culture would have existed without the dictatorial pressure from the Rokkaku Group, headed by Rokkaku Gouji, or his violent and psychopathic police force. Rokkaku Gouji the current Mayor of Tokyo, and has his fingers in many pies; industry, society, legislation and the skater sub-culture, with each affected theme represented by the many beautiful locations in the game. It’s the tiny details of the game I appreciate, such as the dancing birds and animals listening to the radio – and who can blame them. The music is infectiously good, featuring work by Hideki Naganuma, and The Latch Brothers among many talented others. The group you play as – the GGs are effectively the dregs of society, the ragged personalities than don’t fall into the safe categorization of the other gangs, through the player, they flirt with with the ideas of rebellion and creativity more than any other group. They must use their talent, energy and ability to reclaim the streets back from the authorities, despite the strength of the opposition against them. Each GG has a unique style of graffiti which is used to bury Tokyo in their tags, and this together with the skates they use to elude the authorities with, provide them with the adaptability needed for them to exist in this tentative lifestyle. The kid’s style and rhythm is infectious, best shown by the fact that even the animals (from the crows in Rokakku-dai Heights, and the mutant crocodiles in the sewer system) cannot help but bop and sway to the music. The other gangs don’t seem to want to adopt this vibrancy, but are actually quite conformist, wearing matching uniforms (2), and dancing in a regimented style (3). They seem to share more in common with the Rokkaku police rather than the individualist tones of the player’s gang, despite the odd scuffle over territory they pose less of a threat, as other kids with cans, than often brutal reactions of the Rokkaku Group as a whole. The skater culture clearly bothers the powers that be – as Gouji has to influence using power and money, the gang’s retaliations are easier and in some ways more effective. 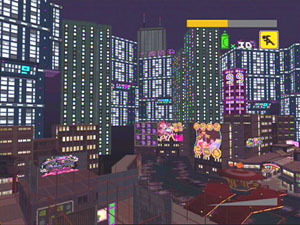 Jet Set Radio Future also has one of the nicest map systems ever. A fully rotatable 3D map that really helps you to pinpoint important areas in the game. You’ll be relying on it a lot for some of the trickier scale led levels. The only reaction the skaters have in all hostile situations is to spray-paint regardless of the level of danger – and they do so because that’s the only weapon they have. The Rokkaku police react with sheer brute force, using a multitude of weapons, experimental robots, helicopters, homing missiles and guns. The priority being to eradicate all gang action through capture (4) or death. They are treated as a collective rather than individual young adults, they each have tag nicknames, and are no longer recognizable by their real names. To further this they are known only as “youths’ on the Rokkaku police radio system. Yet there is a hint of play in all the battles with all of their various enemies, from the tag games played between the gangs to assert their authority, to the bumbling reactions of the Rokkaku police, who stumble over themselves to tackle the youths, and end up as nothing but a paint canvas. The Rudies only crime is to exert their freedom, and in doing so undermine the purpose of the Rokkaku group. Although there are chances to do petty vandalism throughout the game when the mood strikes you. Early on in Rokkaku-dai heights you come across a statue built by the police, warning that “heads will roll” if you break it, examine it again and it topples over. Also through the course of your carefree exploration through Tokyo, you will no doubt bump into many hundreds of people who shriek and howl at you before running away in a shower of knocked over boxes and stalls. The beauty of each area is surpassed by the fact that it is almost entirely free roaming. You can explore to your heart’s content. Even the game’s dirtiest and darkest areas are in breathtaking, pastel-led hues. The gangs never really unite as such against the Rokkaku group (at times it’s suspected that some of the rivals gangs may be working in conjunction with Gouji in return for protection (5). The only solid aspect of the street is Jet Set Radio, the pirate station headed by the charismatic Professor K. He is essentially their mentor, the voice that galvanizes them all into action. Professor K helps the Rudies to understand how to use their skills to their advantage, as well as providing the musical backdrop for the game. The radio also gives the street kids an insight into the minds of the authorities creeping around them. Police reports are leaked onto the underground station, allowing the Rudies to scatter, know where to go next, or how Rokkaku’s cronies can be confronted. However, it is also clear that both parties are listening and reacting to each other at all times. Of course it could also be said that Professor K has a little too much influence over the Rudies, he is in the perfect position to observe and influence them. Rokkaku Gouji exploits this tactic when his masterminds the plan to kidnap Professor K in order to trap or scatter the skater underbelly. Professor K is incorruptible, and therefore his temporary removal towards the end of the game serves as a last ditch attempt to control the GGs and bring them directly into the path of danger. The in-game cut scenes pop out of the screen, and as a result are lovely to behold. The voice acting is quite tidily done with only a few minor fluctuations between the text and spoken voice. The most important area in Jet Set Radio Future is the Garage – and it also happens to be the safest. It is essentially the refuge of the GGs offering escapism, music and security to each member that joins. Most of the displaced street youths have hideouts to call home (6). 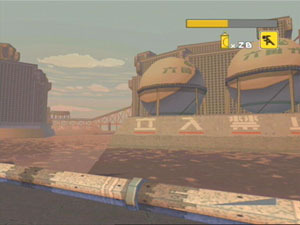 This idea of a place to retreat to features prominently throughout the game, as the playable characters are able to scale most of the levels, going off the beaten track – grinding over pipes and billboards to reach new undiscovered areas which are inaccessible to all but a select few of skating Rudies. “The streets go easy on nobody.” – Roboy. 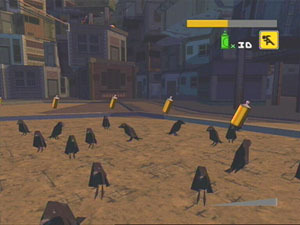 The locations of the game in itself serves as a sort of playground for the Rudies, a network of railings, statues and vehicles to be scaled and used for spreading graffiti and creating havoc. However this talent for navigating hard to reach areas is exploited near the end of the game as the youths are used to clean up the streets, destroying all the stray Noise Tank cyborgs that have run riot. Without the Rudies there to clear Shibuya terminal and its surrounding areas, the normal residents of the area are reduced to blind panic. Even replayed on a 360 system the game looks as lovely as it did back near the Xbox launch. However the original console version is preferable, the emulation onto the Xbox 360 can at times add some hefty framerate lag to an otherwise perfect conversion. It’s this sense of panic that Gouji attempts to seep into the Rudies. Firstly by introducing true chaos to the streets using the Golden Rhinos, then by including a sense of doubt by introducing the idea of Yoyo’s betrayal (7), and removing the safety provided by Professor K’s interventions on the radio. 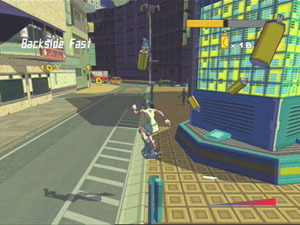 After all the force used throughout the game, Gouji himself resorts to taking over Jet Set Radio, to see if the streets can be influenced in this way. It is a last, desperate act of an official who simply does not understand the city he is trying to control. His vision of Tokyo is a twisted, corrupt mess. Realizing the influence of the Rudies he tries his own attempt at expression, building versions of the skaters to use as his playthings. Of course the real vermin of the streets were never on wheels, but the corrupt organizations swirling above them. It is after all the imperfections of a place that speak loudest, and the people who characterize it’s success. This examination of Jet Set Radio Future was written by Michelle. If you enjoyed this article you may want to read about other games you might like. Don't forget to subscribe to my RSS feed or get updates by email so you can hear about my next game update.